The Craigburn Environment Team is a passionate group of community members who work to develop and maintain outdoor learning and play spaces for students at Craigburn. 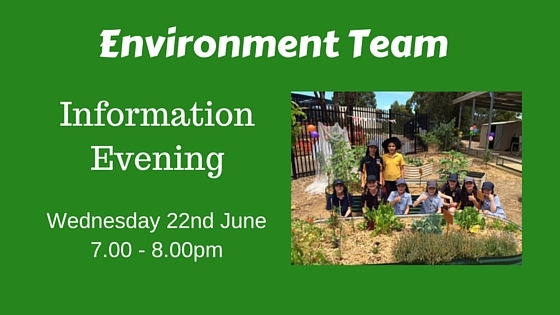 The Environment Team is looking to expand its membership base by inviting parents and caregivers to an information sharing evening, next Wednesday 22nd June in the school staffroom. Topics to be shared include: the role of the school environment team, brief history of the Environment Committee, the school veggie garden, volunteer induction, current and future projects and more. A key focus will be how interested parents can get involved – whether it be at a planning level or assisting with hands-on support. We will be also be undertaking a skills and resources audit as we know there are many opportunities to utilise our community’s experience and expertise. A number of school events are being planned, which will occur over the next four weeks including a coffee/cake and plant stall at the school polling booth on Election Day, Saturday 2nd July, and a school working bee on Saturday morning 16th July. If you are unable to join us on the evening please register your interest here.